"Berkeley director Frances Causey digs deep into the roots of slavery and racism in this informative, powerful documentary." When two daughters of the South, Director Frances Causey and Producer Sally Holst, set out to find causes for the continuing racial divisions in the United States, they discovered that the politics of slavery didn’t end after the Civil War. In an astonishingly candid look at the history of anti-black racism in the United States, “The Long Shadow” traces the blunt imposition of white privilege and its ultimate manifestation-slavery. Causey and Holst conclude that, without a doubt, artifacts of slavery remain at work in American society today. The film is narrated by Causey who reveals that with the help of one of her own ancestors the fight to preserve slavery may have actually been “the,” driving force behind the Revolutionary War. Even after slavery was finally abolished, the South, with its vast political power, made sure its racist Jim Crow laws policies and politics were implemented with devastating effect. These laws amplified and extended white privilege all across the nation by rigging the game against African-Americans, the effects of which can still be measured. Interlaced with personal stories of Causey and Holst’s privileged childhoods in the South, they present a revised history that explains much-needed context when considering the major issues impacting black/white relations today. “The Long Shadow” is not your normal white washed history of America and the legacy of slavery, but an upfront challenge to white privilege in the United States by those who have directly benefited from it, two Southern born and bred white women. From New Orleans to Virginia, Mississippi and Canada, Causey and Holst travel the roads of oppression, suppression, and even hope to reveal the connections of slavery and strong-arm Southern politics to the current racial strife in America. 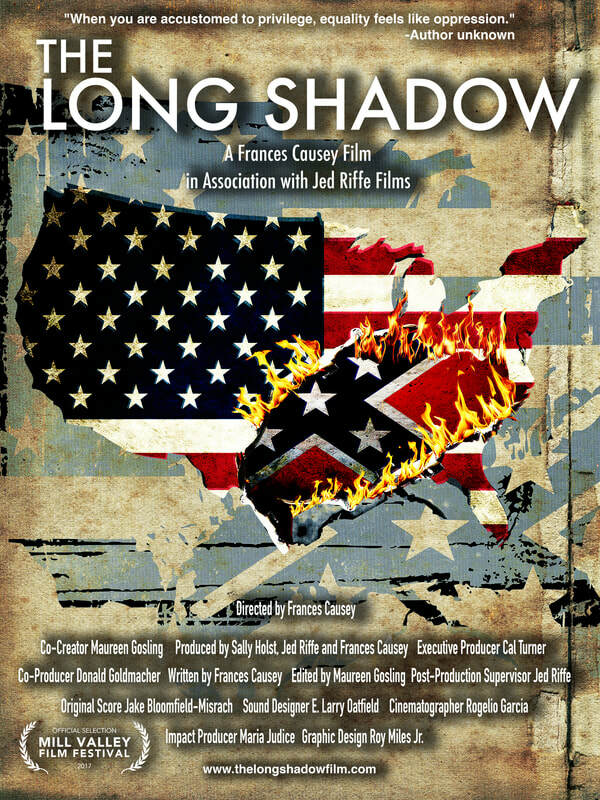 “The Long Shadow” is a disturbing story about the lingering human cost of ignorance, intolerance and inaction in the US, casting a long shadow over our national identity and imperfect democracy.